So here’s the blow by blow account of my first Ironman in Nice, France. I hope this may be entertaining, useful for future triathletes, and perhaps a bit inspiring. 18 months since I first seriously thought about competing in an Ironman triathlon and mentioned it to a friend. 12 months since that idea took seed and grew. 6 months since I increased my training to 5-6 times a week, sacrificing many social events, moderating my food and drink, and generally prioritising the event over all else. 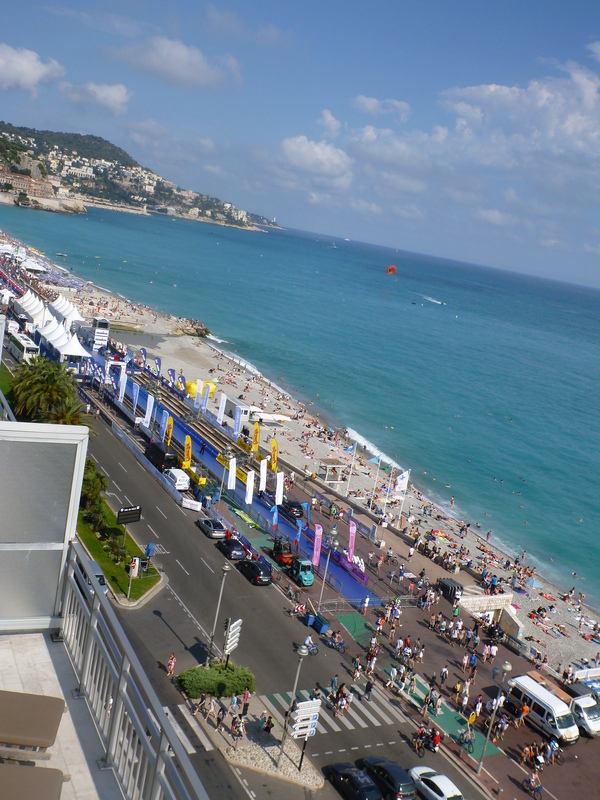 And there I was, finally in Nice, France, on the eve of the Ironman triathlon, June 2014. I unpacked my bike on the Saturday morning and took it for a spin around the coastal roads of Nice. Everything felt in order, apart from my budget Cateye cycle computer which was intermittently playing up. I set up the bike in transition among the 2500 other bikes. I did some quick maths and estimated their total replacement value would be in excess of three million pounds, an impressive sight for bike fans! In addition, I dropped off my bike and run transition bags. I woke at 3am for a quick breakfast by the side of my bed, then rolled back into bed till 5.30am. Then I was up again to drop off my ‘special needs’ bags containing some of my own favourite race snacks – one was to be dropped off at the 70km marker of the bike ride and the other would be accessible on the run. I then checked my bike over in transition to make sure it was still in one piece (no slow punctures, nothing missing, etc). Finally, it was time to don my wetsuit and take a dip in the Med before the race start. Under blue skies, the elites set off at 0625hrs and the rest of us mere mortals set off at 0630hrs in a mass start. I ran into the calm Mediterranean sea and started the first of two 1.2 mile swim loops. The Australian exit after the first lap was the first that I’ve done- with weak land legs, I staggered up the pebbly beach, with spectators’ hands grabbing triathletes and helping them upright before they turned round the short stretch of beach and plunged back in for the second lap. Overall, the swim was surprisingly good for me, apart from salt water repeatedly getting into my goggles, there was not nearly as much jostling as I’ve previously experienced in other open water swims. Transition to bike was blurry from the saltwater that had aggravated my eyes during the swim. The transition was nevertheless smooth and soon I was speeding down the Promenade des Anglais. The start of the bike section was fast and I overtook many competitors. The first short sharp hill reminded me of Yorkshire rather than the Alps and had me wondering if they would all be like that (fortunately they were not!) I had a few early hiccups – bad gear indexing, my chain came off, and soon enough my cycle computer sensor came loose. The last problem would have been bad enough, but I tried to fix the sensor on the move and ended up sticking my fingers in between my front wheel’s aero spokes, resulting in two of my fingers getting sliced open. so I bled all over the Nice countryside. There were long ascents but they did not exceed 10% and I genuinely wooped with pleasure on the early descents, which were long, scenic and fast. However, it was hard to judge the distance covered without a working cycle computer. It wasn’t as hot as is typical for the French Riviera in summer, so I was initially pleased the clouds hid the sun. Feed stations were very efficient, doling out water, bananas, cola, ,energy drink, bars, and gels at regular intervals. Not just a drizzle, but a deluge! Wet manhole covers, treacherous switchbacks, bikes crumpled by the side of the road, the sound of ambulances up and down the mountains. This was getting messy. And I was getting cold. The second half of the bike section was predominantly downhill. I’d been looking forward to hours of downhill, but now, shivering from the cold, I hugged the brakes to avoid going too fast and getting even colder. I shivered for about an hour and a half. The first of my friends caught up with me and told me to hang in – at this point I was so cold I couldn’t keep conversation and my fingers were numb so I was neglecting my need to eat. Smarter cyclists had brought gilets or rain jackets. That wasn’t me. I eventually found a bin bag and fashioned it into a poncho, and slowly my core temperature rose and I stopped shivering. I managed to stay upright when someone cycled into me, then I accelerated towards the final downhill, just to skid on a slick section of painted zebra crossing, bouncing down the road and getting entangled with my bike. In the couple of minutes it took be to recompose myself, another four cyclists came sliding off in the exact same spot. I checked myself over, then my bike, then a friendly attending gendarme gave me a push off and I cruised slowly back to T2, drawing funny looks from the crowd as I was bruised, bloody and still wearing a ripped bin bag! The first run out was fine, as was the return. I felt stronger and stronger as I warmed up back at sea level. The clouds and moved and it became a scorcher of an afternoon. I overtook more people who were slowing down to a walk. The second lap was slower, and by the third I felt SO tired, I had the overwhelming urge to sleep, right by the road side. I realised I had not had enough food or caffeine and that I was probably starting to get sunstroke, so I sipped diluted cola as I walked. I couldn’t eat as stomach felt like it was going to reject anything i put in it. I was later told that it had started to rain heavily during this part of my run, but I don’t even recall that. Friends’ photos jogged my memory a bit, but it suggests that i was in a dark place if i was oblivious to the rain. Fortunately the rain cooled me down and I had the clarity of thought to visit my ‘special needs’ run bag, where I scoffed down a deliciously soft and moist chocolate brownie. Ten minutes later I felt a bit more human, my stomach was happier and better still, I could run again! I ran the end of the third lap and all of the fourth, dedicating the final return leg to my sister, who I later found out had been tracking my progress online all day. On the final return leg I got faster and faster, spurred by the crowds and I built into a powerful sprint that kept getting faster. I am not sure where I got the energy from – possibly from the overwhelming applause, noise, music and energy in the final approach with grandstand seating full of fans. I crossed the line, happy, strong, and just pleased to have completed my first Ironman in one piece. Thanks to my supporters on the day, both in Nice and following me online. The event organisation was of epic proportions, and explains a lot of the huge price tag for the event. The crowds along the promenade, plus crowds in the small mountain towns were all fantastic and spurred me on, so big thanks to everyone who stopped to cheer.